Have you ever lost a key and end up having to change the door lock's core to prevent other people gaining access to your home or office? When was the last time you forget to bring your keys and get locked out? Keep the workplace and home safe and secure with our fingerprint door locks. There are no combination number to be remembered and no keys to lose. You can't forget to bring your fingers with you. They are very simple and easy to use. Your finger is your key to unlock the door. 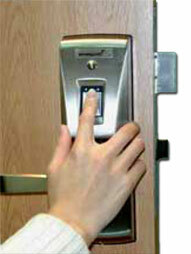 Please come visit us again to check out our latest fingerprint door locks that are coming soon.